His Jaguar was sold off without his permission. Then the tickets and bills began rolling in. 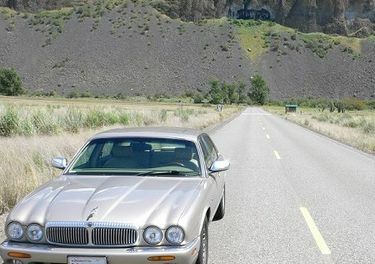 Philip Corsano’s “ghost” Jaguar in happier days when he was touring around Eastern Washington. The car was towed and sold off when he was out of the country. It all started last summer, when Philip Corsano, a Navy-contracted ship’s mate, got word when he was working in Wales that his Jag had been towed from the street at his Seattle home for parking more than 72 hours. Now, "my car is haunting me from beyond." But he doesn’t want to hear any more about it. Not this car, anyway. No more letters about it in the mail. No more collection invoices. Definitely no more notices from the court. It all started last summer, when Corsano, a ship’s mate who contracts with the Navy, got word when he was working in Wales that his Jag had been towed from the street outside his Seattle home. It had been tagged for parking for more than 72 hours. Long story short: Because he was out of the country, he couldn’t get the car back. He says he signed power-of-attorney to a relative who went to the tow yard, but the towing company refused to release the car. The company, Lincoln Towing, has told the Attorney General’s Office that Corsano called from Wales and explained his predicament, but nobody ever came. “We regret Mr. Corsano’s situation, but are not liable for the vehicle not being redeemed,” the company said. So about a month later, the tow company did what they do best: They auctioned off Corsano’s car. While he sat stewing on a ship 5,000 miles away. “My car is sold against my will and someone’s out there joy riding around in it, but they all say ‘doesn’t matter, you have to pay,’ ” Corsano says. Then his old car parked in a disabled spot up in Greenwood, drawing a $450 ticket. That’s when he lost it. “What kind of an insensitive moron parks in a disabled spot?” Corsano says. Amazingly the court file includes this administrative note: “CAR WAS SOLD WHILE IN ENGLAND, SOMEONE WAS DRIVING IT & CAUSED THE (INFRACTION).” So they know exactly what happened, yet they’re still sticking Corsano with the $450! Corsano pointed out to both the city and state that his Kafka-esque story means somebody is driving his car around illegally, without registering it. Both did the bureaucratic equivalent of staring at him blankly. “What if the car kills somebody; will I be liable for that, too?” he wonders. I ran a search through the city’s court database, using Corsano’s license-plate number. A few days ago his ghost car racked up yet another ticket. This one was for “expired plates,” a $47 fine. So now Corsano is being billed for not keeping current a car he doesn’t own. This ticket was given out in north Ballard, so I drove out to the listed address. Lo and behold, there sits Corsano’s Jaguar, expired plates and all. I texted him a photo — he’s now on a ship in Norfolk, Virginia. But the sight of his old friend, now menace, languishing in another’s driveway didn’t exactly cheer him. “Wow that pisses me off, you have no idea how much,” he texted back. Hmm. If the police say he still owns the car, and the city and state insist he remains liable for all of this car’s wayward actions, then maybe we should just go over there and take it back, I suggest to Corsano. Technically it wouldn’t even be stealing, right? I’m just kidding about going all repo man. But I do have the house’s address if anybody in city government is interested in setting this fiasco right.